So this is not all that surprising. Best Buy notified employees last Friday that we would see Ice Cream Sandwich roll out to the DROID RAZR and RAZR MAXX on April 4. As you know from reading this site, there is an update headed to both phones, but it is not Android 4.0 and is instead a bug fixer as build 6.12.181. Best Buy apparently got that memo and has now updated their systems to reflect a “delay” on ICS. That’s sort of an unfair tag, as we aren’t exactly sure that this update was ever going to be ICS in the first place. Will both phones see Android 4.0.3 in the near future? Yeah, they will, but probably not for another few weeks. 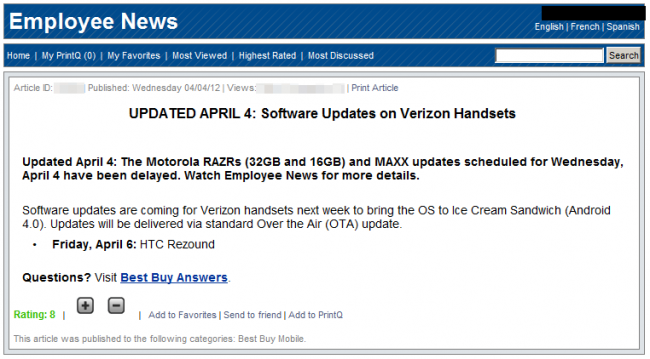 On a related and potentially good note, the HTC Rezound is supposedly still on for Friday, April 6. Do we really believe that it will happen? Eh, we’ll give it a 30% chance.